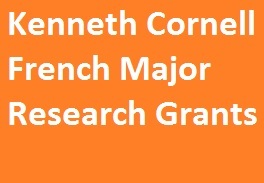 Undergraduates who declare a Major in French or a Double Major including French, and who will graduate as such, are invited to apply for the Kenneth Cornell French Major Research Grant. The grant should be used to travel to France or a French-speaking country, with the aim of undertaking research that will help in the writing of the senior thesis. The grant provides up to 2000 USD to each successful applicant. Applicants should submit a one-page research proposal, including a breakdown of expenses to Director of Undergraduate Studies Morgane Cadieu via http://studentgrants.yale.edu/ . Although no letter of recommendation is required, applicants are expected to have consulted with a member of faculty in the French department regarding the proposed research trip. This should be stated in the proposal. Those who receive funds are asked to provide a one-page report of their research trip to the DUS within one month of returning to the US. Funds must be used before the first day of classes of the final semester of the senior year. There are two deadlines each year: one on the Friday before the October break (open to both juniors and seniors), and a second on the Friday before the spring break (open only to juniors). Decisions will be announced within one month of the deadline. The next deadline for grant applications will be March 8, 2019.